Could it be true? Were my own experiences on the platform, as a host and a guest, merely providing cover for nefarious landlords to run illegal hotels in residential neighborhoods, disrupting not just the hotel industry, but the very livability of the cities in which they set up shop? After reading Slee’s reports, it’s hard to argue otherwise. Similar, Uber has exported its ridesharing algorithms to over 60 countries, spending billions to compete with rivals in China, fight bans in India, and ward off protests from taxi drivers in France. It’s accumulated a net worth of $6 billion for its CEO — all while, incredibly, operating at a loss. Bureaucracy, of course, is no surefire solution, and many Sharing Economy advocates cringe at the thought of the government stifling Silicon Valley innovation. But many cities have attempted to work with these companies, and have been met with indifference and outright ridicule. Although worst-case scenarios have been rare, they aren’t unheard of — they include assaults by Uber drivers, deaths in Airbnb rentals, and so on. Here too, the companies have largely washed their hands of the matter, insisting that they are middlemen and not actually in the hotel or taxi business, and therefore not responsible when things go wrong. In fact, a ratings system seems particularly unsuited to the kinds of one-to-one exchange inherent in peer-to-peer platforms. Unlike reviewers on Yelp, customers are reluctant to provide a bad review to people they’ve personally engaged with, leading to a preponderance of 5-star reviews and no way to tell an “average” Airbnb host from a truly excellent one. 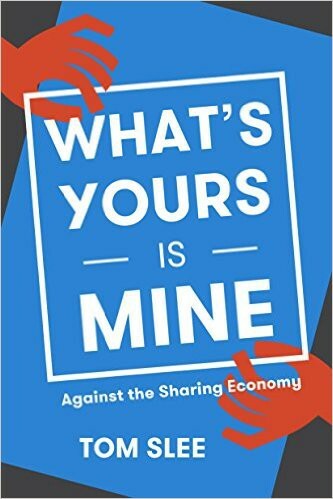 Hopefully, growing frustration among on-demand laborers and growing awareness among consumers will create enough of a backlash to return the Sharing Economy to its co-operative, collaborate roots. Already, some Uber drivers are creating their own apps, including one by a New York drivers’ network intending to share profits among its users. You can buy the book at Amazon or directly from OR Books. I blog about #work #travel #relationships #polyamory & more. Previously from LA & Portland. Currently in Melbourne.